The use of drones in agriculture is a big boon to farmers. They carry the potential of completely transforming and revolutionizing the farming and agriculture industry. Remote sensing using drones is a high-tech system that allows farmers to do things faster and more efficiently than ever before: soil health scans, monitoring crop health, applying fertilizers and watering the fields, even tracking weather and estimating yields, and then collecting the data and analyzing it for prompt action. In short, the use of drones can facilitate the mechanization of every step of farming, reducing the costs of human errors and enabling farmers to react quickly to threats (such as drought conditions and pests), helping them maximize income and their return on investment. While the level of technology available to the agribusiness community has grown exponentially, the cost per acre to utilize this technology has fallen dramatically. It was only a few short years ago that the best resolution available was from satellite imagery with a limit of 15 ft per pixel. That was a large improvement from a previous limit of 1000 ft per pixel. 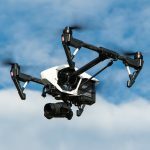 Currently, with the use of drones, we can routinely produce a resolution of ten inches and less than one inch per pixel as required. This combined with the use of near infra-red imagery, allows the evaluation of crop conditions better than evaluating these conditions visually. 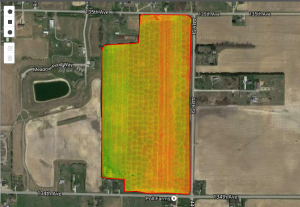 While pricing in excess of $100 per acre were the norm, pricing of less than $10 will now provide total field data, even including 3D imaging producing an elevation map with as little as 1″ differences in topography. What is total field data? It can include, general plant health, pest incursion, invasive species, lack of fertilizer, problems with irrigation, and contour mapping. Contour mapping reduces tiling cost of new fields by showing the path requiring the least amount of tile. Remote Sensing Technologies has developed a propitiatory process known as a Landscan. Using this process we are able to provide the Agricultural and Land Management Communities with actionable, decision making data within 24 hours. This ability has been made possible through the implementation of high speed computing processes and the access to PhD level agronomists. Our chief PhD has literally decades of experience in academia, crop research and entrepreneurship. This makes him uniquely qualified to research and review your data and offer suggestions to increase your yields in agriculture and reduce the invasive species that can be a problem in land management.